This is by no means an ordinary vending machine. The Pan Pacific Beer Vendor is a age verification Beer Dispensing System. The Pan Pacific Beer Dispensing System is a Bio Metric age verification beer dispenser . Not just any old vending machine will work when you are dispensing age restricted products such as beer and wine. With the PPD Beer vendor you can dispense Age Restricted products and rest assured that you are using the most advanced automatic beer dispensing system on the market. 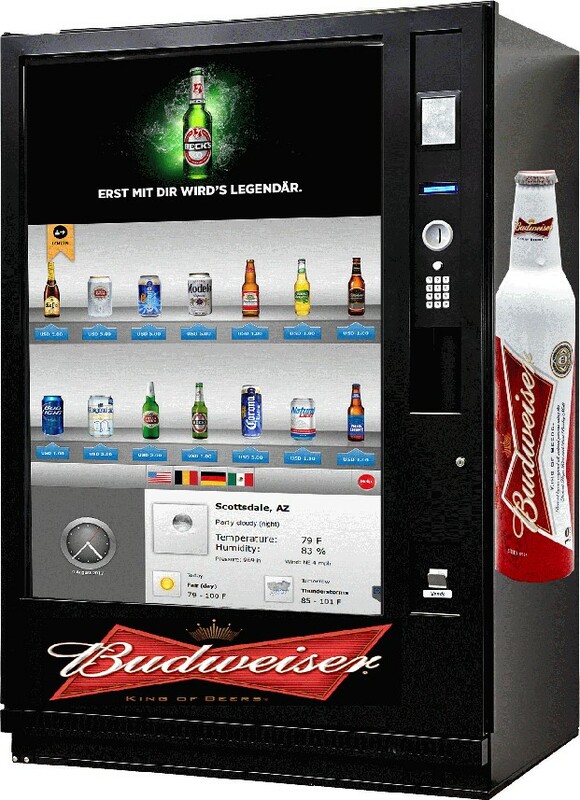 The PPD Beer vending machine uses finger vein biometrics and that means your identifier is you and only you. The high capacity beer vending system is great for large venues with its 45 selections and 405 can capacity makes it a great way to speed up lines and service customers faster. Why take a chance that the system you are using gets a fake ID or that someone else uses the electronic cell phone device that is used to unlock the vend, with the AGM you can rest assured the person whom is using the system is really who they say they are and they are of appropriate age to purchase. The highly attractive Beer Vendor comes with a large 45" touch screen for highly visible display of your products as well as allowing you to run video ads or information just above the product selection area. Want to discount a product without having to go to the machine or how about run a promo video for an event or special deal during the big game, just log into your personal PPD account and make changes right at your desk, that are immediately updated in real time. Need to keep track of how many items have sold and what is running out, no problem the PPD beer vendor can email you alerts and give you sales figures to see what is and what is not selling. Need to restrict a quantity sold during an event or even a quantity per person? The PPD Beer Vendor can do that to. Why use a system that does not give you all the bells and whistles and leaves you with no sales data? You can also call us at 704-802-4394 to speak with someone in person. Looking for a Cannabis or Marijuana Kiosk? Click Here For The American Green Kiosk. Need a vending machine for those Restricted Age products? Pan Pacific has the solution and its called PPD From basic to pro and everything in the middle, we have you covered. The PPD line of merchandisers are built and setup with your needs in mind. Don't just get any old merchandiser as that will not work. You need someone and something that knows packaging and setups of these automatic merchandisers. You need a company that can do custom setups and make your products work for the delivery system used.